GSX is designed to address the comprehensive nature of security, creating an integrated experience focused on understanding the changing landscape, and the tools and tactics to proactively anticipate and mitigate threats. Every year, attendees hear from global leaders who offer insider insights into some of the most important issues facing security management professionals worldwide and the latest technologies changing our industry and our lives. In a world where dictators are falling and rising, governments posture for a greater impact on the global stage, and information is the critical currency, who will emerge and where will opportunities exist? The face of security changed forever on 11 September 2001 and General Kelly, a 4-Star General, U.S. Secretary of Homeland Security, and White House Chief of Staff, has protected the United States both abroad and at home. His unique ability to provide first-hand insight into the evolving geopolitical landscape around the world is valuable when contextualizing the United States’ security priorities from a historical, current, and future perspective. 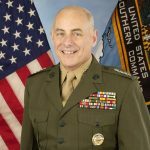 Gen. Kelly will share his insights—on Wednesday, 11 September during the keynote address at GSX—on the trends, risks, and potential rewards amid the ‘hot spots’ around the globe, and the role the U.S. plays (and should play), in our nation and world’s security. Secretary Kelly enlisted in the Marine Corps in 1970 and went on to serve in a number of command, staff, and school assignments. During his command of SOUTHCOM, he worked closely with professionals in U.S. law enforcement, particularly the FBI and DEA, and the Department of Homeland Security, dealing with the flow of drugs, people, and other threats against the U.S. homeland. He went on to become the Secretary of Homeland Security before serving his country again as White House Chief of Staff until January 2019. General Kelly’s keynote presentation will start Military and Law Enforcement Appreciation Day off at 8:30 am. GSX will honor members of the military and law enforcement with a full complimentary day of education sessions and access to our exhibit hall—an interactive learning lab full of immersive experiences and cutting-edge technology. Use code “THANKS” when registering and bring your ID onsite. Visit again to see the other Keynote speakers we have planned for Monday, Tuesday, and Thursday.